With a landscape full of seemingly random crosses, the country of Lithuania displays its religious devotion and pride. In their article on Lithuanian crosses, Giedre Mikneviciene and Marija Nemuniene, say, “Crosses are an inseparable part of the Lithuanian scenery” (1). Many people travel to on pilgrimages different places. The more popular places being Mecca, Jerusalem, or Stonehenge. One of the less known destinations is a hill located in the town of Siauliai, in Lithuania. The Hill of Crosses is known for being a place of remembrance for Lithuanian Catholics. The Hill is exactly like its name and is covered in crosses, placed there over the years by the many people who visit. The reason why the people of Lithuania placed crosses in different places is because of religious reason. Before the spread of Christianity stone pillars were placed to worship pagan gods. The different types of crosses are Cross Double-cross crest, Double-toried, roofed pillar, Pillar-type chapel, Chapel, and Curonian cross board (3). Siauliai, the town where the Hill is located was “occupied by Teutonic Knights during the 14th century. The tradition of placing crosses dates from this period…” (Gray). Though the hill has a long history many of the crosses are relatively new. This is because the Hill has been destroyed several times. Once when the Tsarist Russia oppressed Lithuania and Poland. The people of Lithuania revolted and many were killed on the Hill of Crosses. So, to remember their countrymen crosses were placed, but were immediately destroyed multiple times. The Hill survived through german occupation during World war II, and both Mikneviciene and Nemuniene state, “There were four organized cross demolition waves but the Hill of Crosses would constantly revive. The fight for the survival of the Hill of Crosses lasted for about 20 years” (6). In 1993, the Pope John Paul II paid his respects to the those who lost their lives during the revolt. He commended their efforts in keeping their religion alive and then erected a cross in their memory. Also, “a hermit of the Franciscan Brothers was consecrated on July 7, 2000” (“Hill of Crosses”). Now the number of crosses placed on the Hill has grown exponentially due to tourism and the Hill is a place of peace remembrance and worship. Gray, Martin. “Hill of Crosses.” Sacred Sites. 1982-2016, sacredsites.com/europe/lithuania/hill_of_crosses.html. Accessed 20 Oct. 2016. “Hill of Crosses.” Sanctuaries and Pilgrimage Sites. Catholic Internet Service, 1998-2001, www.lcn.lt/en/bl/sventoves/kryziuk/. Accessed 20 Oct. 2016. Journeyman Pictures. 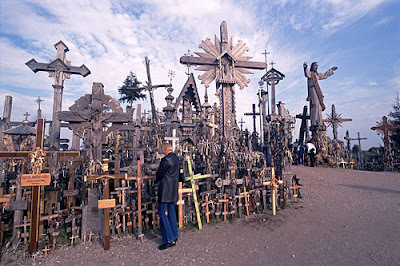 “Hill of Crosses-Lithuania.” Youtube. www.youtube.com/watch?v=P0nX9PGRW64. Accessed 15 Oct. 2016. Mikneviciene, Giedre and Marija Nemuniene. "Lithuanian crosses and the spirit of place: Transmitting the spirit of place." The Institute for Design and Restoration. Vol. 16, Fall 2008, pp. 1-10. Motuzas, Alfonsas. "The Origin of the Hill of Crosses, Devotional Practices and Music of the Pilgrimages." Scholarly Papers University of Latvia: Oriental Studies, vol. 793, no. 10, Fall 2013, pp. 79-83. This site contains more information and a way to book a trip to the Hill of Crosses. This website provides a short history of the Hill of Crosses in Lithuania and little details on the different types of crosses present on the hill. This site gives a list of places in Lithuania that is not limited to just the Hill of Crosses.